West Ham brows may be becoming more than a bit creased at a forthcoming summer which – if progress is to be maintained – could turn out to be even more expensive than last year. And that’s almost entirely down to the striker position although additionally left and right sided defenders are probably going to be required. However, up front there are big problems, and the assumption that monies will be forthcoming from a, say, £45 million sale of Arnautovic to buy Maxi Gomez, may or many not represent reality. Even if it does, it means that whether it’s Arnie and Maxi leading the line, we will need three more as it seems to us that Lucas Perez’s day is done , Chicharito’s may be and Andy Carroll’s is most definitely. 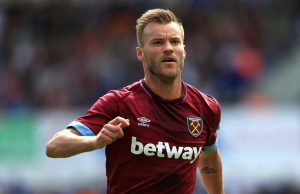 Yarmolenko’s return will boost midfield. That leaves three strikers to be found and unless we are looking at the bargain box this becomes a very expensive business as they are the priciest of all positions to fill. Director of Football Mario Husillos’ skills will be required to find one – never mind three – at prices which in a hugely inflationary market, are likely to be as high as it gets. A right back may be needed with Zaba coming towards the end of a great career and cover for Cresswell another necessity given the Arthur Masuaku situation. Midfield may not be as critical as some may feel with Lanzini, Yarmolenko and Sanchez having recovered from injury and although we have our doubts about Winston Reid long term either he or Ogbonna are decent cover players for the Balbuena/Diop partnership. It’s a fact that Manuel Pellegrini was left with a very average squad and for him to make one in his own image is going to cost big time. So a summer of big board investment is required and given how well the manager has done in leading us to mid table with a decimated squad there really should be no arguments from the Davids! I think a lot will depend on whether we are in Europe, players to go Huggill, Oxford, Byram, Obiang, Carroll, Hernandez, Perez, Masuaku, Adrian. The plus in our locker is that we have players like Ben Johnson, Nathan Holland, Silva, Diangana, Makasi, Marcus Browne, Coventry, Cullen etc in reserve. If not next season then the season after they should be ready to fight for first team places. Silva looks the most likely to replace Hernandez as the fox in the box but we should go for Gomez he is young aggressive, quick, good in the air and strong, just the sort of player we are missing. I think we need to spend minimum the same again next year plus whatever we can get back in transfer fees for the other players. If we could get Duvan Zapata also who we bid for he is also a real handful.